With the Graphite 780T the Corsair engineers have packed all the performance and expandability you need into a beautifully compact case design. Your components can be displayed through the decent sized window panel on one side of the case, it is also opens with a touch for easy access to clean or maintain your components. The 780T from Corsair also features Direct Airflow Technology that keeps everything cool and quite for the best PC experience. 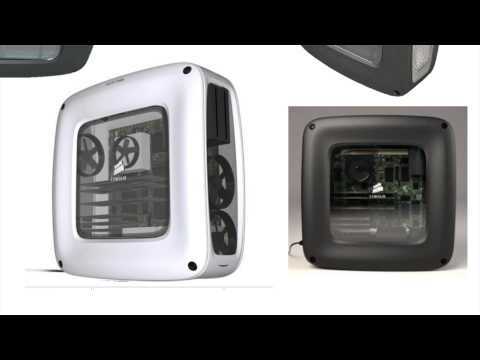 The graphite series from Corsair is an artfully crafted exterior. The side panels require no tools or twisting to get at your components for maintainance or upgrades. Meaning more time for gaming. The 780T has ample space for all the components you require and also space to cool them all. The 780T is designed with Corsairs Direct Airflow Technology, this gives you greater airflow out of the box, the large diameter front intake fans deliver plenty of cool air into your high-performance components to keep them running optimally, then the rear extractor fan pushes out the warm air to further increase cooling inside the case. The AF140L fans are custom-engineered by Corsair to deliver high-volume airflow with less noise and turbulence. The extra-large diameter allows them to run at a lower RPM, and they’re positioned to deliver cool air directly to your GPUs. A front panel switch allows you to toggle between silent and performance modes. Two 140mm white LED fans are positioned at the front with one 140mm fan positioned at the rear to extract the heat. The 780T has room at the front, rear, bottom, and top for radiators, allowing you to quiet down your GPU and CPU with liquid coolers, this also allows you to get better overclocks out of your components for better quality gaming. Corsair Graphite Series 780T White Full Tower Case w/o PSU is rated 4.8 out of 5 by 11. Rated 5 out of 5 by Grieg99 from Excellent system at a great price I'm extremely happy with the system I purchased. It was easy to build the system using the online configurator and the build quality of the completed system was excellent. It even arrived a day sooner than I expected! I've have no problems when using the system and it runs very quietly. The performance when gaming is excellent. Rated 4 out of 5 by drizz786 from nice looking but needs more heft. lovely case and simple to work in , put a ryzen7 build in and love the generous cabling room behind the mb. But there is more plastic and at this price i was expecting more metal, coming from an atcs monster, but it is a good case and full of nice touches. Rated 5 out of 5 by Lozzer from Great Features Great case, easy to install main board and accessories. Very Pleased. Rated 5 out of 5 by RomasNoreika from Corsair 780T Beutifull, a bit expensive, spacy, but the quality could be just a bit better. Rated 5 out of 5 by Thomas4841 from Corsair Graphite 780T (W/O PSU) My son wanted this case and having seen it i am extremely pleased with all aspects of the purchase and service. Rated 5 out of 5 by carrotmop from A solid and spacious case I recently built myself a new gaming machine and wanted to get a new case along with it. After much reading of reviews and descriptions, I chose this one. This case is lighter than my last (Cosmos II S), and even though they are the same size, appears to be more spacious inside. I like the grills on the front and top that have a spring loaded release, making fitting extra fans a breeze (no pun intended). The cable management is excellent and has made my case look tidier than I think I have ever seen it. The air flow is excellent and coupled with a good quality after-market fan keeps my processor and GPUs (2 GTX 980s - not the Ti variant sadly) nice and cool. I have an i7 6700k 4GHz Skylake and the temp never seems to go above the high 40s, even after playing either Assassins Creed Syndicate or Fallout 4 for hours at 2K resolutions with all the extras turned on. The HDD caddy is nice, but I especially like the three extra clip-in trays for SSD drives. They are located just behind the HDD caddy and are very useful if you want to save space. If all you have are SSDs then you could even remove the HDD caddy altogether. I have a mix though (attempting to phase out the physical disks) I have read that the case can dis-colour and develop a yellow tint if left in direct sunlight too long, but mine is under my desk. I have not had cause yet to try the variable fan speed, but otherwise the front panel is useful for easy access to USB ports and headphone jacks. I would offer only one piece of advice; make sure that the case will fit where you want to store it. I didn’t bother because I already had a full tower in place and the desk I had was built around it. The first time I got *that* tower case though was a nightmare, hence the desk built around it. Rated 5 out of 5 by nfxcr3w from It's like a fridge and very big coming from a mid tower its very easy now to move around in for future upgrades i recommend this over a mid tower any day of the week. Keeps all my component's very cool and Thanks to scan order came quickly so removing my component's for the next day was challenge but worth it. Rated 4 out of 5 by robobutcherpl from really good size tower Really good tower, look really good and it's solid. I had only one problem with the noise from the window side. Couse it's plastic without any rubber under if you have a water cooler it just start vibrating and make a lot of noise. will you be ever getting the yellow version of this case ? and can you confirm that the LED fans are white or blue in this case ? I have bought the white version of this case and the fan lights are a very light blue. close to white, but not quite. will Corsair Hydro Series H100i fit in this case? H110i in mine with room to spare , top mount.